This finishing salt gift set spices up cocktail hour with globally inspired flavors. All-natural sea salt is enhanced with robust flavors like black lava and lime. They are Made in the USA without any additives, artificial flavorings, or anti-caking agents and come with flavor profiles and suggested drinks to try mixing up. Dimensions: 5.5" x 4.25" x 2.75"
The order arrived as promised, was wrapped very securely & tastes quite good. A novel gift for a foodie. We use it sparingly for the right taste. Is well worth it. 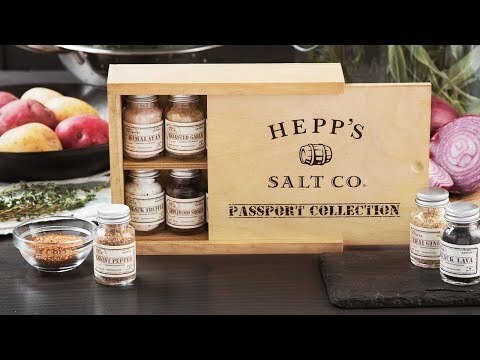 Brian Hepp channeled a lifelong cooking passion into the finishing salt gift sets from Hepp’s Salt Co. As Brian will tell you, these gourmet salts aren’t the typical table salt that gets tossed around lightly, but rather are unique blends created to elevate at-home cooking. 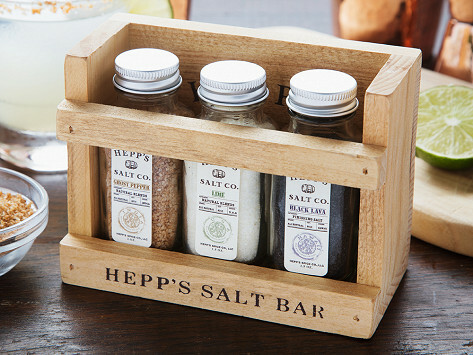 The Minnesota-based Hepp’s Salt Co. infuses sea salt with distinctive, delicious flavors, like the exotic-sounding black lava and the grill-ready Applewood smoke. The all-natural salts have no additives, artificial flavors, or anti-caking agents, and each comes with a flavor profile and suggested cuisines to try it on. What Brian and his wife, Amber, started as a salt bar at local farmer’s markets became a must-have seasoning for foodies and professional chefs alike. It’s an easy, tasty way to spice up everyday cooking.